It’s been a Very Clean Week in Wedgwood! Wedgwood’s Scout Troop 166 trimmed trees and shrubbery along 35th Ave NE at NE 81st Street. The corner of NE 86th Street, at present a vacant lot, is owned by Seattle Parks Department. 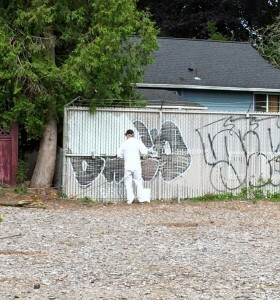 On June 4 the City did paint-out of graffiti and junk removal from the site. When the time comes that the Parks Dept. opens the process of turning the site into a pocket park, the Wedgwood Community Council will coordinate public input on it. While we wait for funds to be implemented for park development, the site is home to Wedgwood’s newest eating-out option, the Goreeng Food Truck.